Gillette® Fusion® Proglide® Flexball™. 1 razor. 1 cartridge. Responds to contours for our best shave. Our thinnest, finest blades. 5 blades. Gillette's best shave. Great even on sensitive skin. 1. Flexball™ responds to facial contours. 2. Our thinnest, finest blades* with less tug and pull** for incredible comfort. 3. Precision trimmer on back for accurate edging. 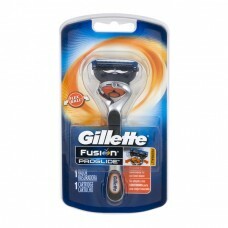 Fusion proglide blades preferred 2:1 when used with flexball handle technology†. †Overall preference vs. former Proglide among former Proglide users. Gillette. The Best a Man Can Get®. All Fusion cartridges can be used with all Fusion handles. (*First 4 blades) (**vs. Fusion). www.pg.com. Comments? 1-800-GILLETTE. www.gillette.com. ©2015.